The idea of bringing your baby into the pool for the first time might seem scary, especially for new parents. What if I told you the whole experience can be stress-free for both you and your child? Warm water keeps your child relaxed – just like they were in the bath at home! The body’s natural reaction when entering cool or cold water is to tense up. 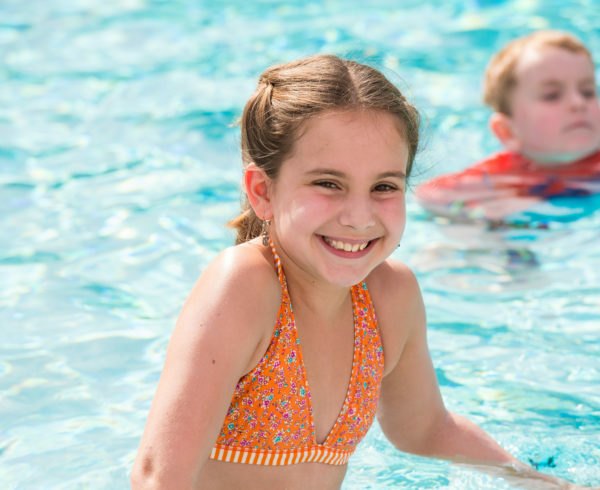 Finding a pool that maintains a minimum temperature of 86℉ is a simple step you can take to help keep your baby relaxed in the water. It also makes the whole experience a lot more comfortable for you. There are a few different ways you can hold your child so they feel confident and safe in your arms. No matter which position you choose, make sure you can always see their face so you know it’s elevated and out of the water. The most comfortable position for your baby would be to cradle them at your side, similar to how you might hold them outside of the water. This is a great position to start or if your child is a little bit more cautious in new situations. Once they’re comfortable, you can try a horizontal position. With one hand cradling their stomach, use your other hand to hold their chin and face up out of the water. With this hold, you can keep them close while they have their first few kicks in the water! Finally, you can try the back float hold – there are two different ways you can do this one. The simple way is to hold your baby in front of you, making sure their face is supported out of the water. This way they can see you and you can talk to them. A more advanced way, which I personally like more, is to hold them so their head is cradled on your shoulder. Once they’re positioned, you can slowly bring your shoulder down to the water. You might feel them flinch a bit if the water hits their ears, but this is completely normal. Oftentimes in our classes, we sing soothing songs, like Twinkle Twinkle Little Star, when babies are in new positions like this one. 3.) Double diaper your baby! The last thing you want to be worrying about during baby’s first swim is a leaky diaper. 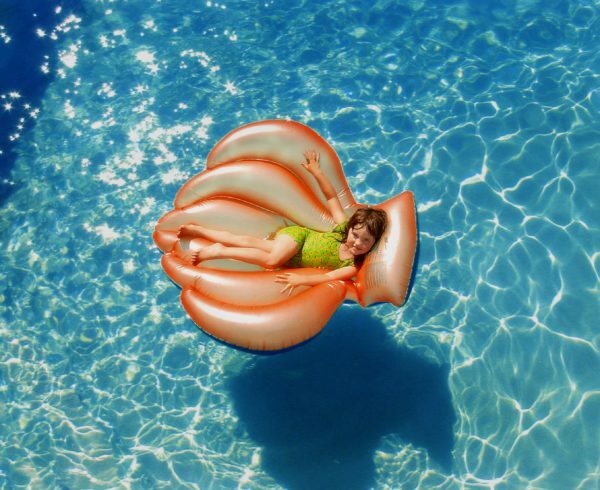 Although most swim diapers say they are leak-proof, accidents can (and do!) happen. To put your mind at ease and avoid having to explain the situation to the pool maintenance folks, I recommend putting a reusable diaper over your child’s disposable swim diaper. A reusable diaper should fit snugly around your baby’s waist and legs to keep any unwanted leaks at bay. Bonus tip! Keep your baby steady – no bouncing around! Any parent knows that bouncing or rocking is often the easiest ways to calm a panicked baby. 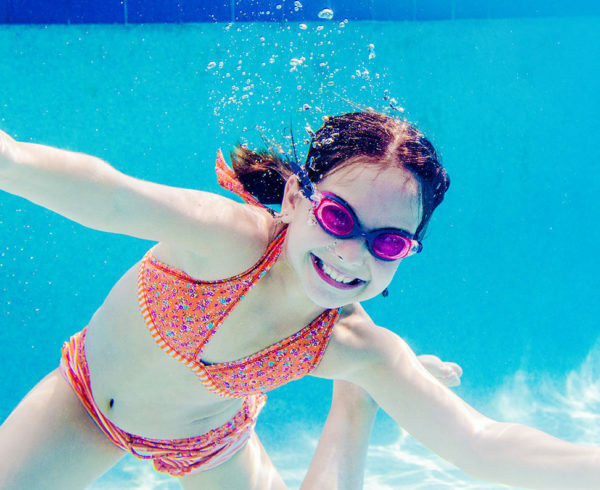 Though these tactics may be calming outside of the pool, they can actually scare your child on their first trip into the water. Rather than a playful bounce during baby’s first swim, hold them steady and still so they know they’re secure in your arms. Again, it’s important to always be able to see your child’s face. Once they’re more comfortable in the water, then it’ll be time to play around more. Share your experience with baby’s first swim with us in the comments! 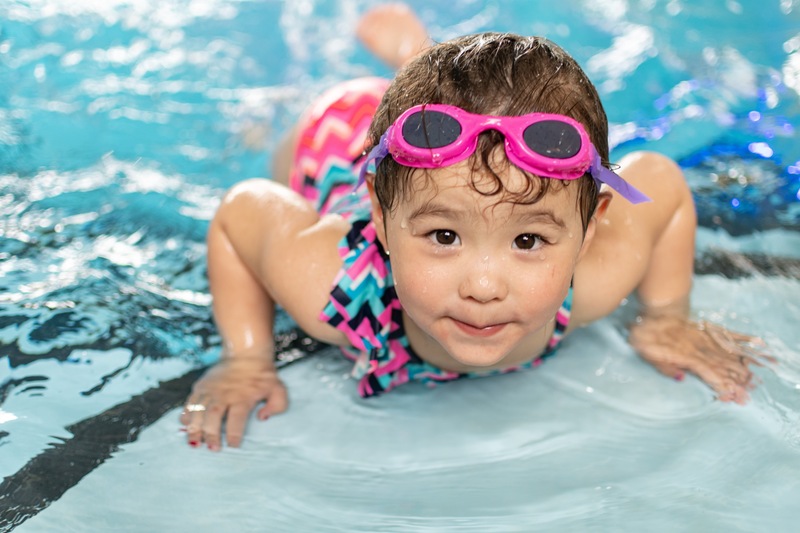 Make Your 1st Swim Class Great!